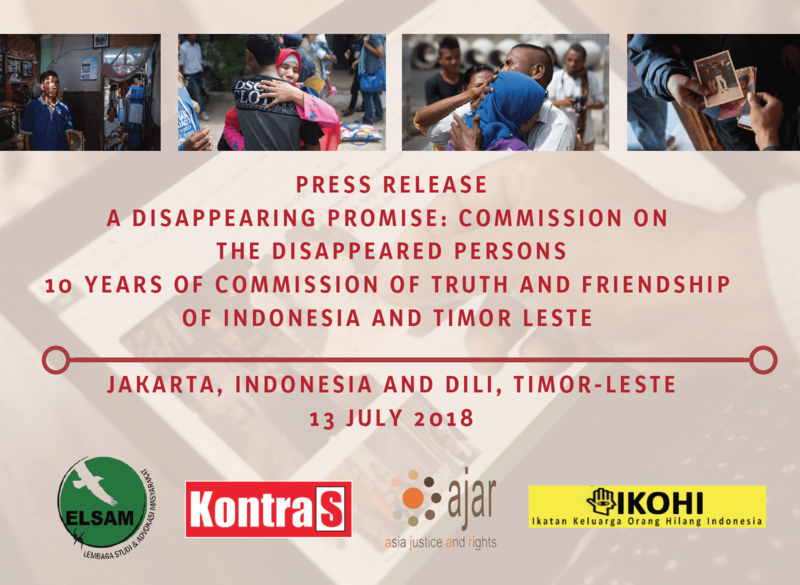 15 July 2018 marks the 10th anniversary of Per Memoriam Ad Spem [Through Memory towards Hope], the final report of the Commission of Truth and Friendship (CTF) of Indonesia and Timor-Leste. This initiative, the only bilateral commission in the world, was tasked with strengthening peace and friendship between the two countries by revealing the conclusive truth about the nature, scope, and causes of the violence committed in East Timor in 1999. Many people appreciated the CTF as the way to acknowledge the past and support the building of good relationships. The CTF made significant findings about gross violations of human rights, crimes against humanity, and institutional responsibility. Five important recommendations from the CTF report cover: 1) accountability and institutional reform, 2) joint border and security policy, 3) documentation and conflict resolution centre, 4) economic and assets issues, and 5) a commission on disappeared persons. The executive summary of the report adds another important recommendation on acknowledgement, a firm commitment to prevent recurrence of such violence and fulfill their rights. Almost every year since the report’s release, CTF recommendations have been discussed during Senior Official Meetings between the governments of Indonesia and Timor-Leste. Most discussions seek to strengthen bilateral political and economic relations. However, there has been no progress to date regarding the recommendation to establish a commission on the disappeared. The CTF concurred with findings of the Timor-Leste truth commission, CAVR, that thousands of East Timorese children, now adults, were forcibly transferred to Indonesia. Under its recommendation regarding a Commission for Disappeared Persons, the CTF recommended that both countries take action to identify the whereabouts of children separated from their families and notify their families in Timor-Leste. Meanwhile, civil society organizations have tracked “stolen children” and their families since 2013. A working group has documented a total of 111 forcibly displaced victims; and 57 of them have participated in family reunions in Timor-Leste. These reunification efforts have received support from human rights institutions and related ministries in both countries. The majority of the stolen children who have been documented have had a difficult life and are still struggling with trauma. A challenge for the reunification effort is that some of those displaced now identify with a different culture, tradition, and religion than their families of origin. The governments of Indonesia and Timor-Leste have a responsibility to establish a commission on the disappeared. The commission should prioritize the identification of these individuals and their families of origin, ensure access to citizenship procedures, and provide recovery for those suffering from trauma. Both governments must work together to facilitate visits between “stolen children” and their families by granting them a special visa status. The recently-established Centro Nacional Chega! in Timor-Leste is developing a mechanism to document and to find “stolen children” as well as to facilitate a massive and procedural reunion of them with their families. It is important that fostering good relations and cooperation between Indonesia and Timor-Leste regarding disappeared persons and reunification acknowledges the history of the conflict and situates these visits in the context of reparation and respect for victims’ lives. Otherwise, these good initiatives may bring a sense of friendship without acknowledging the conclusive truth that is needed to fulfill victims’ rights.